I hear the rumblings. African-American women are upset. 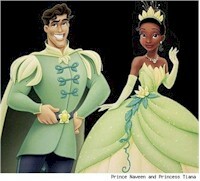 They finally get a black princess and she spends most of her time as a frog. To make the situation even worse, she ends up with a white prince. I get it. Really I do. But come on ladies. The more important question? Does she have a mother? A dead mother? Does the mother die during the movie? Or is she simply non-existant? I haven’t seen the movie but I’m just *dieing* to know. The last movie I took my daughter to see was Finding Nemo. I think she was nine at the time. Not only does the mother die on screen but there was some sort of brutal attack by a gang of killer fish. My daughter is scarred for life. She has never been to the movies since. Oh sure, she says its because she hates sitting still for so long but I know the truth. The image of that dead mother fish is burned into her brain. Being in the movie theater brings back the traumatic feelings. Does anyone know if this new movie is safe for sensitive teens? We didn’t see Little Mermaid 3 but I understand they go back in time just so we can find about the brutal crushing death of Ariel’s mother. And Bambi? Was that movie really rated G? Rugrats is rated PG because there are poop jokes. Really? Poop jokes need parental guidance? The mother is alive and is a wonderful role model. And I was never under the impression that the Prince was caucasion, but Latin. Has to do with the song. Throw Mama from the Train. Probably to increase royalties. when i saw the trailer on the tv i just had to take my daughter to see the movie very funny. This African-American mom was not upset by the white/hispanic/latin prince (not sure what he was). Anyhow, I was more concerned with the voo doo undertones and our christian values! My husband and I rented it (I reluctantly) since they have seen all the white princess movies. It did portray voo doo undertones like I was warned:( Fortunately, this gave us an awesome opportunity for a family discussion about what others believe. All three girls (ages 11, 10, 7) enjoyed the movie, and I was one relieved Mama.